General Capital was selected as lead developer for McAuley Apartments, the 46-unit “annex” building to St. Catherine Residence on East Knapp Street in Downtown Milwaukee. St. Catherine’s has provided safe, supportive housing for low income women since 1894 and for women with special needs since 1993. The new facility was named after the founder of the first women’s home opened by the Mercy Sisters in Dublin, Ireland. The new facility is an extension of St. Catherine’s mission, but with a more independent, self-sustaining operational model. The existing facility is a licensed boarding house with the capacity to house 150 women. Many face significant health and life challenges including alcohol and substance abuse problems, chronic mental health diagnosis and physical disabilities. 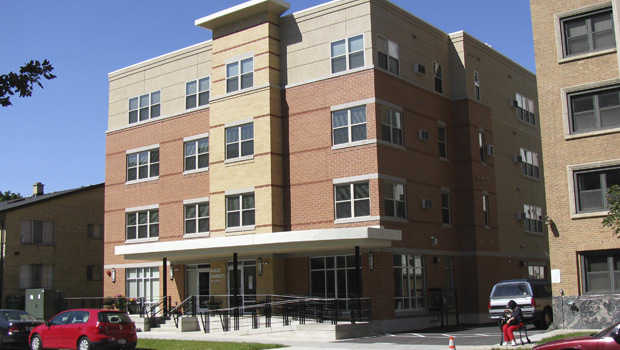 The new building continues to serve this special population with private one-bedroom and efficiency units, a unit type that is in great demand but not readily available in the existing facility. General Capital was responsible for designing the new facility, securing section 42 tax credits, coordinating donors, obtaining competitive bids, managing the construction process and ensuring a successful lease up to stabilization.